Wayne State University Press, 9780814334867, 170pp. 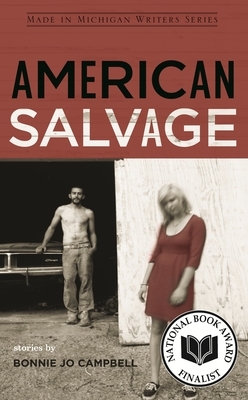 New from award-winning Michigan writer Bonnie Jo Campbell, American Salvage is rich with local color and peopled with rural characters who love and hate extravagantly. They know how to fix cars and washing machines, how to shoot and clean game, and how to cook up methamphetamine, but they have not figured out how to prosper in the twenty-first century. Through the complex inner lives of working-class characters, Campbell illustrates the desperation of post-industrial America, where wildlife, jobs, and whole ways of life go extinct and the people have no choice but to live off what is left behind. The harsh Michigan winter is the backdrop for many of the tales, which are at turns sad, brutal, and oddly funny. One man prepares for the end of the world-scheduled for midnight December 31, 1999-in a pole barn with chickens and survival manuals. An excruciating burn causes a man to transcend his racist and sexist worldview. Another must decide what to do about his meth-addicted wife, who is shooting up on the other side of the bathroom door. A teenaged sharpshooter must devise a revenge that will make her feel whole again. Though her characters are vulnerable, confused, and sometimes angry, they are also resolute. Campbell follows them as they rebuild their lives, continue to hope and dream, and love in the face of loneliness. Fellow Michiganders, fans of short fiction, and general readers will enjoy this poignant and affecting collection of tales. Bonnie Jo Campbell is the author of the novel Once Upon a River (July 2011, W.W. Norton). She was a 2009 National Book Award finalist and National Book Critics Circle Award finalist for her collection of stories American Salvage, which won the Foreword Book of the Year award for short fiction. Campbell is also author of the novel Q Road and the story collection Women & Other Animals. She's received the AWP Award for Short Fiction, a Pushcart Prize, and the Eudora Welty Prize, and she has been awarded a 2011 Guggenheim Fellowship from the John Simon Guggenheim Memorial Foundation.